Another exciting week with fresh grub from Fresh Fork Market! In this week's bag I got radishes, more collard greens, zucchini, Swiss chard, lettuce, cilantro, strawberries, corn chips, cabbage, sharp cheddar, beets, peas, more greens, and some spinach. I'm not a big fan of peas and since I was out of town on my designated pickup day (and the next day, and the next day...) my lovely mother picked up by bag-o-veggies for me and took them home with her. My first opportunity to cook was Sunday night, and I used up some random things in my freezer and fridge to make a taco salad with corn, imitation Chipotle rice with lime juice and cilantro, lettuce, tomatoes, avocado, super delicious guacamole my boyfriend made (we ate it with the corn chips from Fresh Fork), Blaze Gourmet mild salsa (purchased at the Fresh Fork Market truck), and Upton Naturals chorizo seitan. 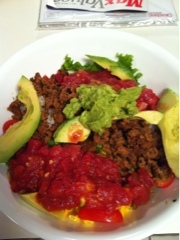 This was my first attempt at making a taco salad and I think it ended up being really good! The texture of the chorizo wasn't quite what I was expecting (I normally use another brand of meatless crumbles) but it was pretty good. My open minded but meat eating boyfriend liked it so much that he only ate half of his so he could take the rest to work the next day. I still had some kohlrabi left over from last week so I skinned it, chopped it into small cubes, tossed it with some olive oil, garlic, and garlic salt and roasted it in the oven at 450 degrees for about 40 minutes. If you have a stove that isn't from the 1970's, it might cook a little faster. I decided to make the radish recipe Fresh Fork Market provided this week for Ruby Radishes. I followed the recipe to the letter except for the part about butter. I used some Earth Balance instead. (too much, actually...I'd cut down on the "butter" next time around) I also sliced up the radishes since I only had one bunch of them. Clean radishes and slice into coin sized circles. Melt the "butter" in a skillet over medium heat. 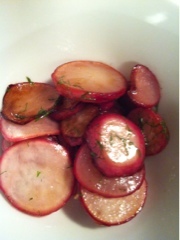 Add radishes and toss to coat with "butter"
Cover the pan and cook for about 4 minutes or until radishes become soft. Add sugar and vinegar and toss for 1 minute. Sprinkle with dill and season with salt and pepper to taste. I thought this side dish turned out pretty well. Minus using too much butter, obviously. I think I could have used more dill, too. I should have, actually, since the dill in my garden is growing out of control. So...another successful week with fresh fork veggies. Tonight I'm going to cook up some zucchini, use up the rest of my lettuce, and try and figure out what to do with my beets. Do you have any favorite beet recipes?